This modern castle style home design is reminiscent of a European Castle with high-end custom finishes and luxurious furnishings throughout. Olde world charm is on display in the intricate stonework, wood arches and dramatic architectural style. Below are pictures of the interior design as well as exterior landscaping of the beautiful estate house. European castles were symbols of wealth, power, and elegance. Their architectural style withstood the wear and tear of centuries of history, their massive structure-heavy designs made to stand the test of time. Contemporary culture and building technology has adapted however and these types of buildings are usually forgone by in favor of more minimalist and modern mansion styles. But the ornamentation and stylistic choices of rough stone exteriors, shingle roofing, second story turrets, and castle parapets give this abode a rustic charm rarely seen nowadays. 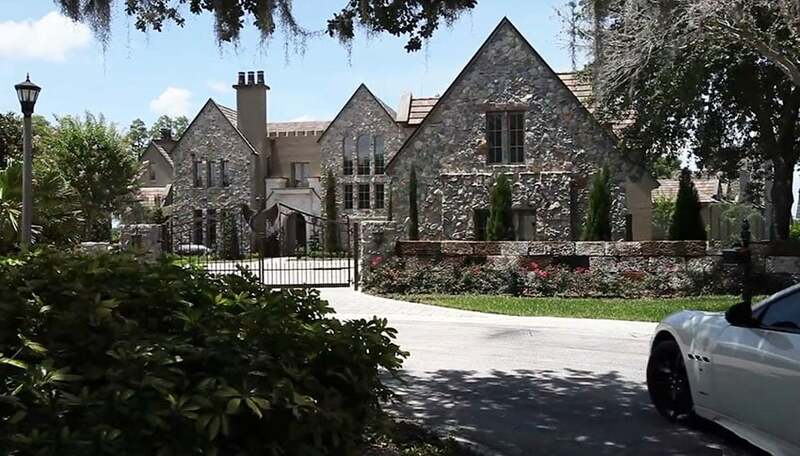 The paved driveway of this massive Olde World style home is almost deceivingly humble. This endearing and rustic facade, with its stone-clad exterior walls, steep-angled gable roof with shingles, long and slender ground-level and clerestory windows, and wrought-iron driveway gate belies its massive and unquestionably sophisticated interiors. 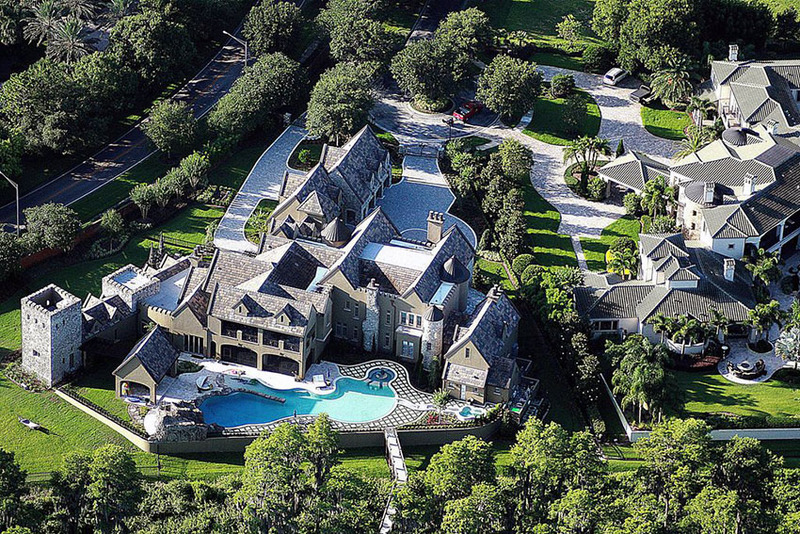 All 15,332 square feet of this mansion were expertly designed and skillfully crafted to create spaces that capture both contemporary style and 6 bed, 8 bath, 15,332 square foot piece of classical style architecture. 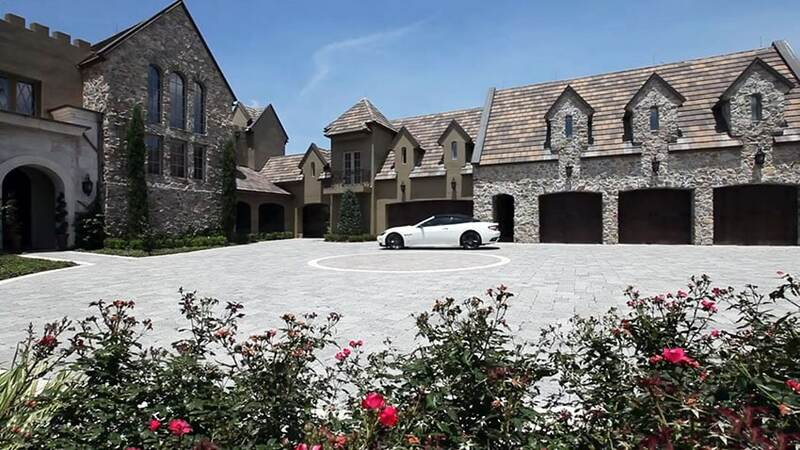 The five-car garage sports stone-tile exterior-grade flooring, recurring motifs of massive archways and dormer roofs, and rough stone-wall cladding that reinforces the old castle aesthetic. Subtle and classy landscaping was used to give the courtyard some life but still lets it keep its class. 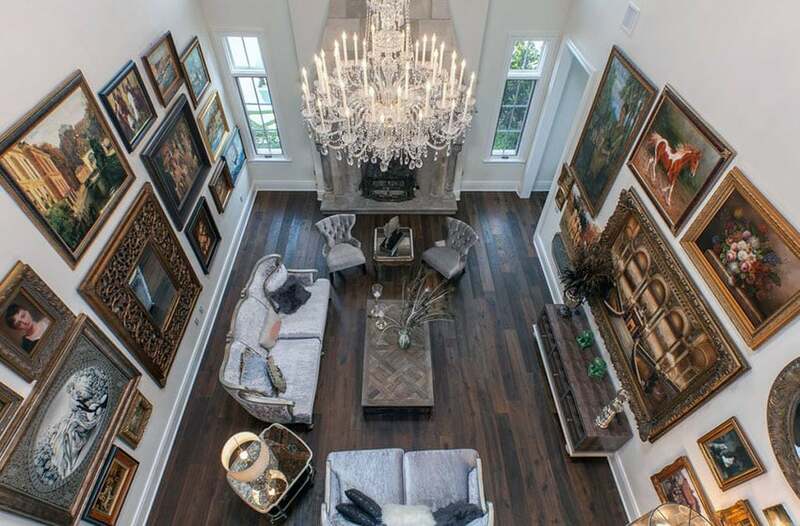 The formal living room of the home takes full advantage of its high ceiling by employing high and slender clerestory windows as well as a glass chandelier, all of which provide adequate ambient lighting to the living space. This further adds to the spaciousness of the room and keeps it feeling bright amidst all the rich dark colors of the other room elements. The travertine covered stone fireplace serves as a grounding centerpiece to the design. The living room also boasts a wide variety of Renaissance artwork. The ornately carved frames further enhance the beauty of the paintings themselves and help adorn the tall white walls with personality and style. The seating furniture used are also uniquely rustic, with their gray upholstery going well with the rich dark browns of the oak wood floorboards. The camelback sofa as well as the tufted wing arm chairs are accented by the parquet-patterned wooden coffee table at their center. The heart of any home, kitchens must have style as well as function. This home’s kitchen, in contrast to the spaciousness of most of the other interior spaces, has been designed to be more personal, intimate, but nonetheless stylish and elegant. The rustic picnic dining table and eclectic use of dining table seating, with the subtle accent of flower centerpieces, create a cozy ambiance that can only be found in a home kitchen. The white shaker cabinetry along with the painted white walls also do well to contrast the rich brown of the floorboards and beams. The tufted barrel lounge chairs and almost randomly sized framed pictures on the back wall gives users a nice nook to chat in. 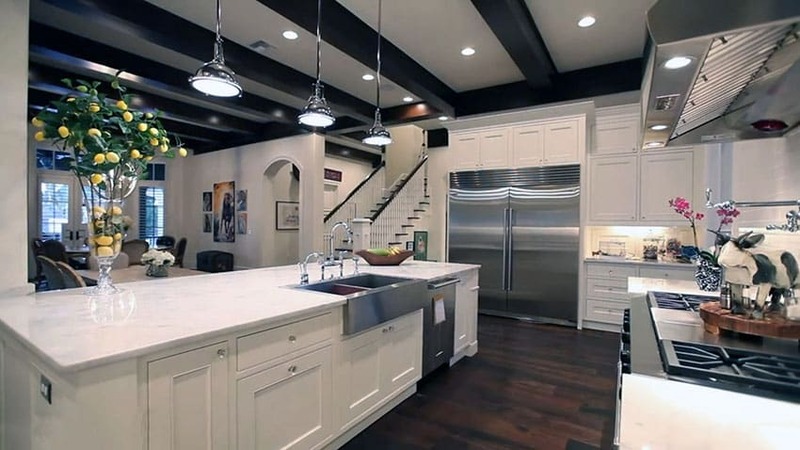 Here we see more of the beautiful white shaker cabinetry as well as the cool, stylish chromes of the appliances and sink. The chrome pendant lights also add to this soothing, stylish effect and provide good lighting for the countertop. Worth noting also is the subtle use of accent flora all around the kitchen, to keep if feeling fresh and vibrant. 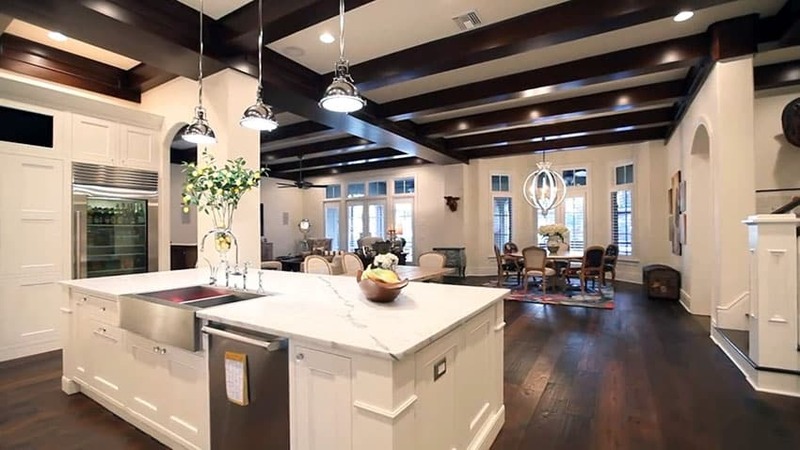 The open beams of the kitchen are also seen better from this angle, showcasing numerous pendant lights that light up the space with a cool white ambiance. The white kitchen island sports a beautiful white marble countertop that perfectly complements the shaker cabinets. A contemporary and stylish chandelier is used on the main dining table area, with a similarly contemporary and colorful rug that offsets the brown of the hardwood floors. The numerous slender french windows let in a lot of sunlight with blinds that lend privacy to this intimate kitchen space. 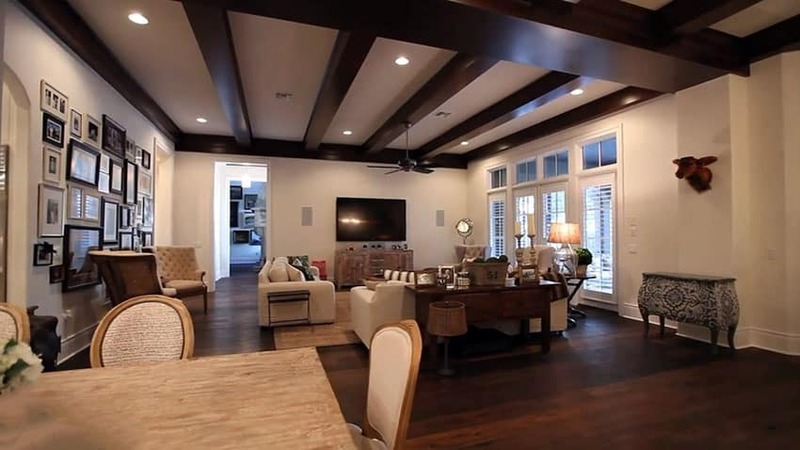 This transitional living room, also as intimate as the kitchen area, is located in the same vicinity as the kitchen. It has low-back mid-century modern sofas that are a refreshing contrast to the various rustic and classical furniture pieces found in the room, ornately patterned decor pieces, and eclectic, varied use of lamps, side tables, consoles, and tabletop pieces. This space adds the most amount of personality to the room and further creates an ambiance that makes you feel at home. The rounding centered arrangement of seats lends a functional intimacy to the family living room. 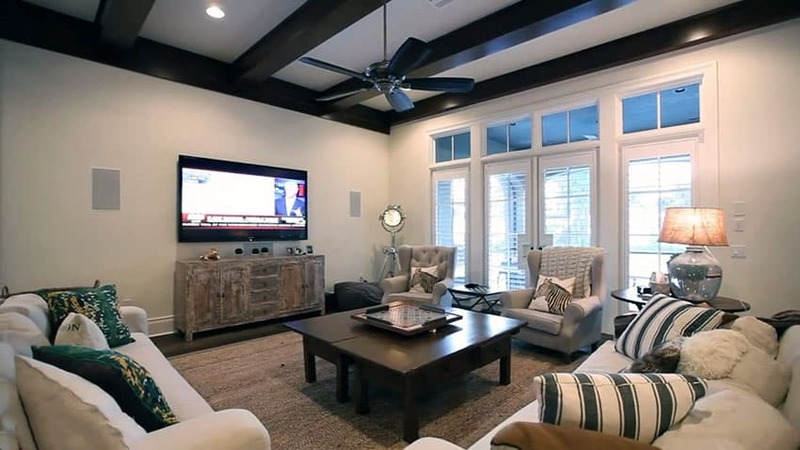 The aforementioned eclectic furniture choices are seen more clearly, with tufted club lounge chairs, a spotlight-style floor lamp, a seemingly re-purposed and rustic console table, various patterned throw cushions, and french doors that lead straight to the outside while letting light inside. Gold and black is a bold color combination that is all about mystery, class, and style. The main dining room employs a gold and black floral patterned wallpaper that keeps the room feeling sophisticated yet personal. The brick flooring gives off a rustic charm that is further carried out by the stone fireplace located at the back end of the room. The main dining table and chairs are contemporary and bold and further bring out the true centerpiece of the dining room: the custom bird cage brass chandelier. 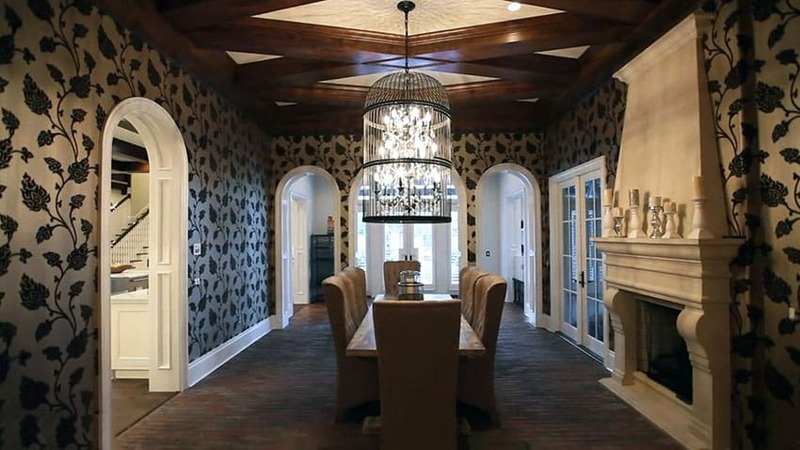 The arched openings and ornately patterned ceiling treatments add an appreciated further touch of class to the room. The massive arched wooden door, as well as the suit of armor, high ceiling, and crystal chandelier, carry on the European Castle theme of the mansion. 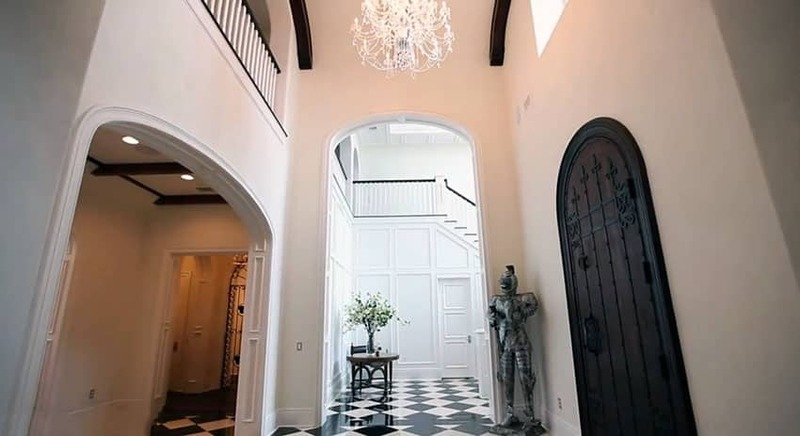 The black and white checkered tile floor is the perfect mix of contemporary and classic and is carried out exceptionally well in this hallway design. 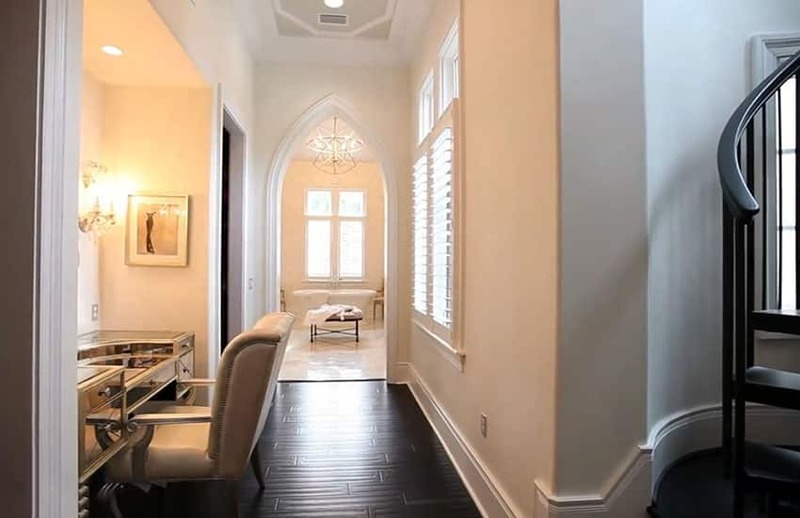 The arched entryways also serve as a sophisticated and classy welcome motif in this space. The various lighting treatments, with intimate warm white pendant lights in the inner spaces and the bright daylight brought in by the clerestory windows for the outer spaces, there is visual harmony in this area. 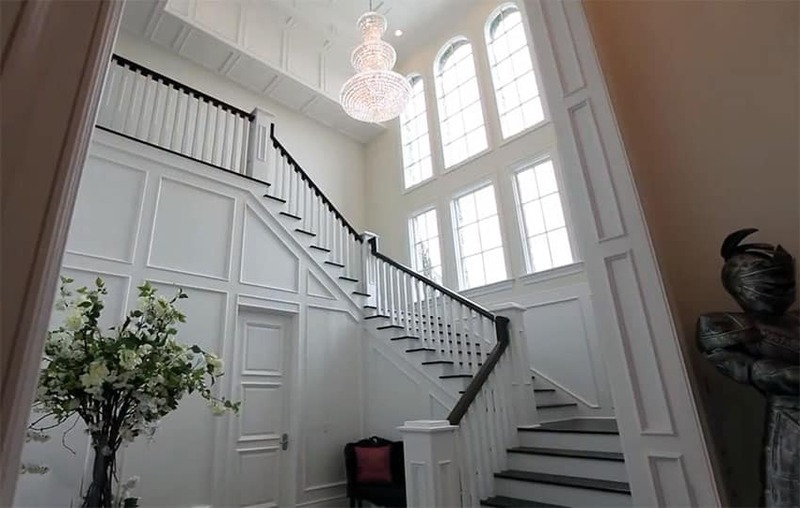 This grand staircase keeps its color combination simple – black and white. The french clerestory french windows light up this bright space and further accents the stylish sterility of such a predominantly bright white color palette.The crystal chandelier that decorates this ceiling acts as a point of attention and is a clever complement to the general feel of the space. The stark and subtle splashes of black on the railings and stair treads break visual monotony and enhances the ambiance of this grand staircase. This luxury Art Deco master bedroom displays the most amount of personality and uniqueness out of all of the spaces in this gallery. This is mostly due to the wall-mounted sculptural artworks of animal heads, the eccentric styles of the furniture used such as the human head coffee table at the window, and the varied use of materials and textures on the bed and armchairs. Bedroom are commonly the most personal and private areas of the house and so it tends to also be the most personalized. 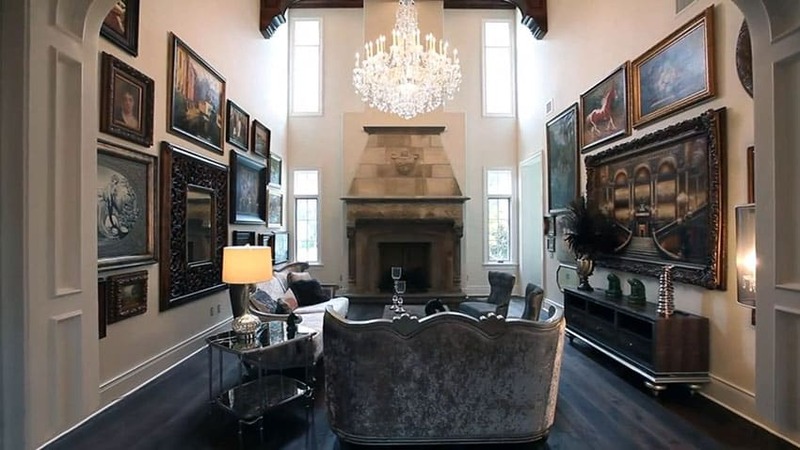 That said, this space still keeps the elegant and high-end motif of the modern castle by employing classic black and white color combinations, using beautiful design pieces such as the glass chandelier, and generally keeping the room spacious and stylish. The makeup and powder room is a quaint area that is located right outside of the master bathroom. This area is adorned by laminated wood flooring, a nicely-furnished personal arm chair, a central table for the basic necessities of a powder room, and classy warm white wall-mounted lighting that bathes the space in a mellow yellow. 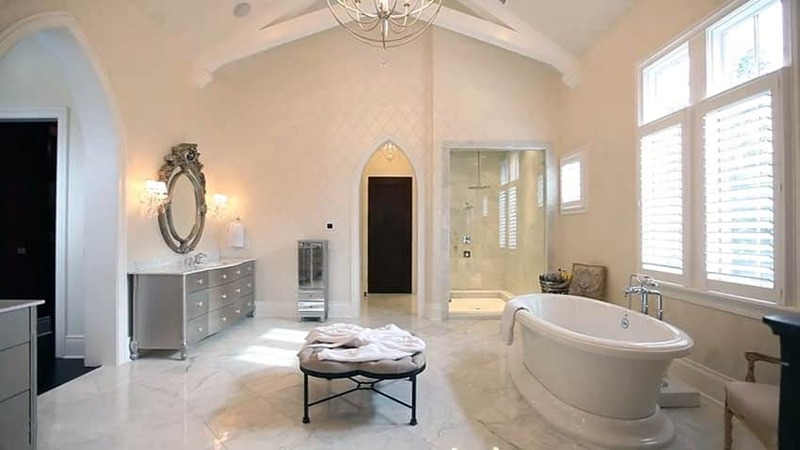 The arched doorway that leads to the bathroom is an elegant touch. The bathroom is not only a space for grooming and cleaning but also, typically, a space for relaxation and quiet reflection. As such, bathrooms like this one employ pure white decors to keep it feeling light and welcoming. The marble stone floor tiles, the diamond white wall tiles, exposed trusses on the ceiling, and beautiful steel orb chandelier all help create an ambiance of peace and tranquility. The glass-enclosed, rain shower head shower enclosure is spacious and elegantly designed. The oval bathtub located right next to wide windows give the user a space not only to bathe but also to rest. This personalized custom wood home office and library is the perfect space for quiet study and contemplation. With its shelf-lined walls, dark-stained wood shelves and flooring, and the tasteful use of classic pieces of Victorian furniture, this personal study is optimized for private use. Although kept minimal in number in order to keep the space feeling private, the french windows located on the outer wall are wide enough to let sufficient amounts of light in. The bright red carpet serves as the pièce de résistance and gives a bold helping of scarlet color into the otherwise solely dark brown space. The life-sized mammoth replica is also a nice piece of decor that makes the space undeniably unique and stylish. Outdoor kitchens are often used on large-scale custom home pools. 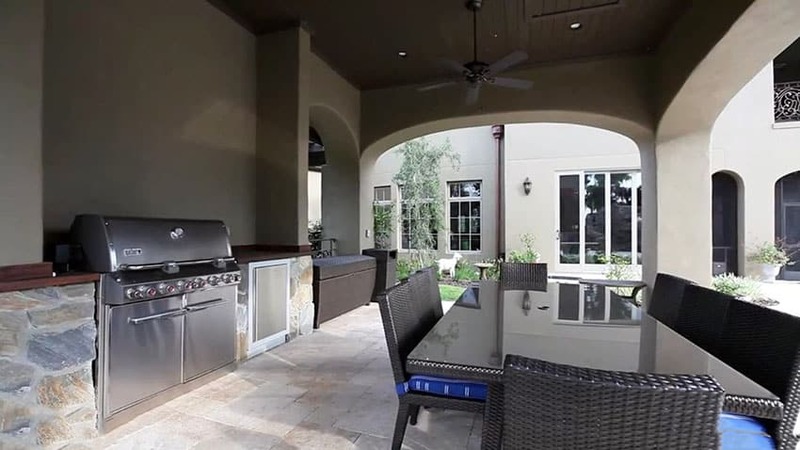 This is because often times, outdoor pool areas are also used as areas for events and parties; outdoor kitchens are then utilized in serving barbecues, hors d’oeuvres, and cocktails. This particular lanai area has travertine floor tiles, a nice glass-top dining table and plastic wicker dining chairs, nice high ceilings with ceiling fans, and an outdoor barbecue grill and fridge. The beach lagoon-side pool is the defining feature for the outdoor spaces of this modern castle. The palm trees, amazing pieces of landscaping themselves, act as a subtle curtain that gives the area some amount of privacy while still providing sufficient and picturesque views of the lagoon at the back. 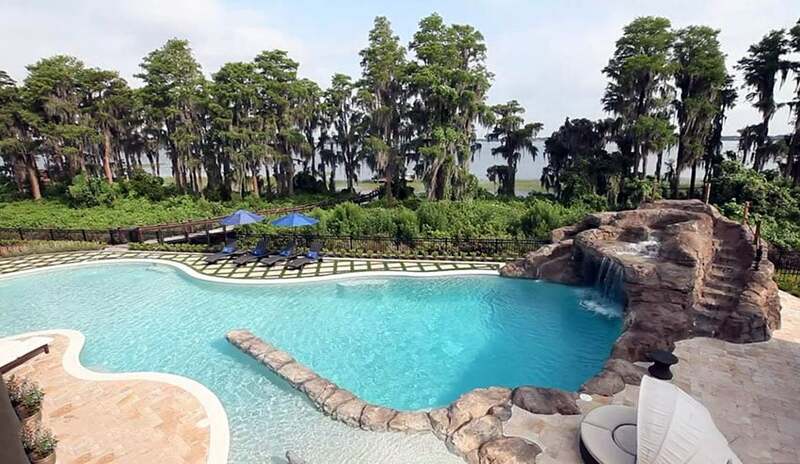 The pool itself, with a lazy river type of organic design, employs a faux-rock waterslide that serves a second purpose as a intriguing piece of decorative landscaping. 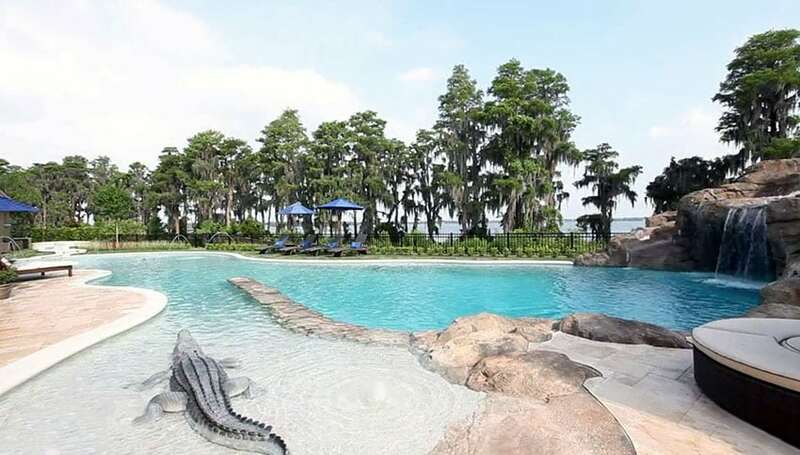 This eccentric use of an alligator statue carries on the motif of using animal figures as decor and design pieces. The swimming pool itself has several lounge chairs and areas for the owners and their guests. The varied size and arrangement of the tan travertine floor tiles have a linear quality that contrasts and complements the organic, curvilinear edges of the lazy river pool. The use of faux boulder features keeps the pool feeling natural and untamed. The custom waterfall hides a cozy little nook that lets swimmers have some intimacy or privacy. The outdoor kitchen is also seen to be located closely to the pool, letting the two spaces interact with each other seamlessly and easily. Varying styles of lounge seats and poolside benches also keep the place feeling lively and vibrant. 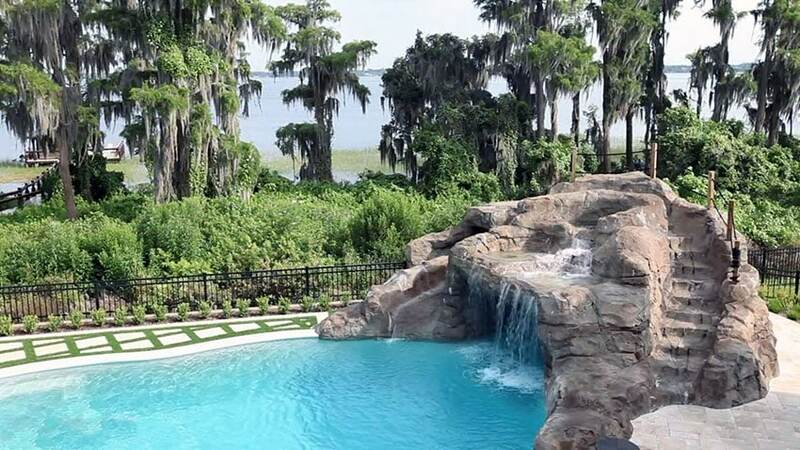 The water slide-waterfall design piece is backed up by the shrubbery and trees that separate the estate from the massive and majestic body of water at its back. This luxury swimming pool acts a nice recreational area as well as a space to be used for guest gatherings or events; large-scale estates and mansions rarely do without custom pools such as this one. The swimming pool behind this modern estate home is fronted by a house face vastly different from the stone-laden frontage of the house seen from the other side. This is to keep this area feeling welcoming and provide a contemporary feel to this area. The grass pavers as well as the small bits of landscaping give some freshness and vibrancy to the pool area. Various balconies and doorways are also located poolside, a design choice that lets the outdoor and indoor spaces communicate harmoniously with each other. This video features “Cartmel Lane” (https://vimeo.com/69484133) by Uneek luxury Tours which is licensed under CC by: http://creativecommons.org/licenses/by/3.0/ – Changes made include editing screenshots. For additional home designs visit these pages for a French Provincial home , Tudor style house or a Tuscan style home.